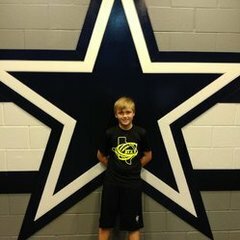 [IMPORTANT] Please post & vote all cowboy fans! Well, this Sean McVay offense is all things imaginative. The way the Rams get Todd Gurley out in space, creating one-on-ones for the dynamic tailback ... The windows they open for the premier intermediate thrower in the business, Jared Goff ... And the opportunities dialed up for all parts outside, even the little-known Josh Reynolds. Thus, Leighton Vander Esch might have to make like Waters, playing all over the field -- staying with Gurley out of the backfield, as well as getting enough depth in his drops to disrupt skinny posts, deep slants and Goff teardrops in between layers of coverage. My colleague Maurice Jones-Drew feels McVay will go up-tempo, so that Dallas DC Rod Marinelli cannot rotate linemen. Perhaps. But if Goff starts slowly, like he did in multiple December games, the 2018 Dallas rushing offense might not let L.A. off the mat, either. The Rams must thwart Ezekiel Elliott, or else they won't have enough possessions to impose their offensive will. Especially if Scott Linehan wakes up and realizes how talented a runner his QB can be. Great matchup. Continuing the tradition from last week, it's about time we start discussing who we want to play next. On the one hand, we are 8-1 at home, and getting an NFCC game in Dallas against the defending SB champions would be amazing. We have also already beat them twice. Plus playing the higher rated NO Saints team on the road where they are known to be unstoppable is something less than ideal. On the other hand, we have already beat the Saints as well, and beating the Eagles 3 times sounds tough like we are pushing our luck. Plus we would have to cheer for the Eagles again this week. Last week was hard enough. If Philly beats the Saints then they will be for real contenders and not the joke I think they are. I want no part of that. Saints all the way. A loss to the Eagles at home in the NFC Championship game would be a sports nut-punch the likes of which I have never felt. Still, I think Eagles at home are an easier matchup than Saints on the road by a long shot. Give me the Eagles. Maybe you finally got your "s" because the Cowboys are going to win a Super game. Anyway, I suggest you save some of your medicine this week because we will need a GDT next week as well. I am taking hope in a few things I thought our Ol played one of its best games of the year against Seattle and figure that trend will continue. The sack fest really stopped sense we added Cooper. Dak’s sacks per pass attempt decreased by half the last eight games of the season compared to the first 8 games . Our D has been lights out when playing with emotion and a chip on their shoulder I expect that trend to continue.